Home Articles Does Exercise Improve Concealed Carry? 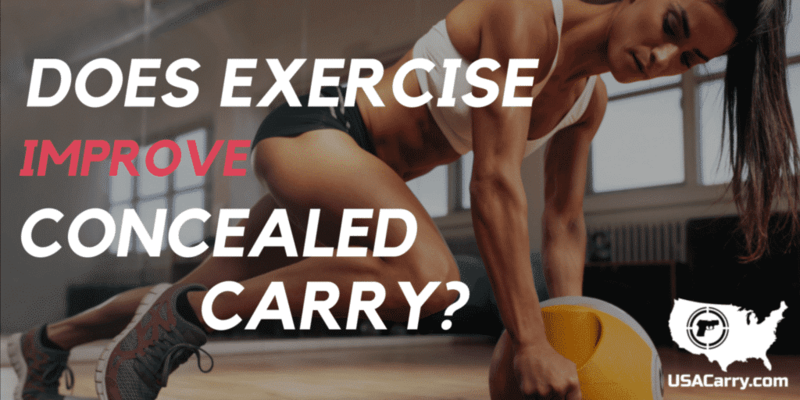 Does Exercise Improve Concealed Carry? In this article, we’re going to explore some opinions on how exercise affects concealed carry skills. Why do we need exercise in the first place? Isn’t having a gun more important than a workout? Anaerobic fitness – isometric and core muscle workouts that improve balance, perception, and reflexes. You and your physician understand best what type of exercise you can do so ultimately all these recommendations are simply that – our best ideas on what types of workout improve CCW abilities. But don’t take our word for it — check out Mr. Colion Noir working with noted exercise scientists studying the effects of aerobic and core exercise activities and shooting ability. You don’t have to hit the gym necessarily to get a great CCW workout. One of your biggest friends in shooting and reaction is your core muscle group. This is the system of muscle tissue that is beneath all the “show” muscle. The Mayo Clinic illustrated out some good exercises which help improve balance, flexibility, and core strength — all necessary for keeping your bearings under pressure. Anything that strengthens your hips, abdominals, and legs is going to be extremely useful. The gun moves where you tell it to — not the other way around. Even though most concealed carry pistols and revolvers are relatively light (less than 2 lbs), maintaining that weight for an extended period of time can cause your arms and body to shake as you struggle to keep the sights aligned. Pull-ups/Chin-ups — If you can’t do a pull-up, try doing a pull-up “hang” instead. When selecting a weight, start off with lower weights and work up. If you can do a set of 12 or 15 without issue, try increasing the amount of weight or the repetitions until you find something challenging. Whether it’s just making a commitment to walk every day or more advanced High Interval Training – getting that heart rate up can help your body simulate and adjust to high-stress, high-pressure environments. Concealed carriers and gun owners have died due to heart attacks following a successful defense against an attacker. No matter what cardiovascular activity you decide to participate in, consult with your physician to determine an ideal elevated rate and maintain it for at least 15-20 minutes – ideally closer to 45 minutes. That rate will change with your age and other physiological factors so please do consult with a healthcare professional prior to beginning any exercise regimen. Athletic fitness and a steady exercise regimen will help improve your visual acuity, perception, and situational awareness in addition to your ability to respond to a life-threatening emergency. Having a concealed carry handgun is only one step of the equation — physical fitness is another important piece of that puzzle. Next articleCan You Recognize and Clear these 4 Types of Handgun Malfunctions?